The staff of Synergy Swimming is led by cousins Dale Kerrigan and Jamie Shaules, with assistant Joe Shaules. We all take our work seriously, but we don't work seriously as it is always fun. 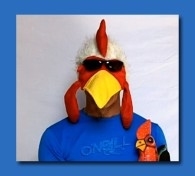 Our chief instructor is Mr. Chicken.